Accepts up to 12 credit card type cards on badges. Suitable for cards 85mm (W) x 55mm (H). Keyhole slots for removal off the wall. ISOPROXII proximity and RFID cards. Credit card/ attendance card / ID cards. Cards 85mm (W) x 55mm (H). We stock a comprehensive array of plastic and metal clock card racks that will take any standard or a non-standard clocking in cards or swipe and ID cards, the racks are manufactured in either plastic or metal and have been designed for simple installation, for health and safety precautions the racks can be quickly removed from the wall to provide an indication of which staff are on site in case of an emergency. 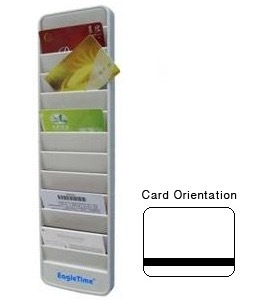 The card racks are available from our stock and can be delivered by next day courier service if required.